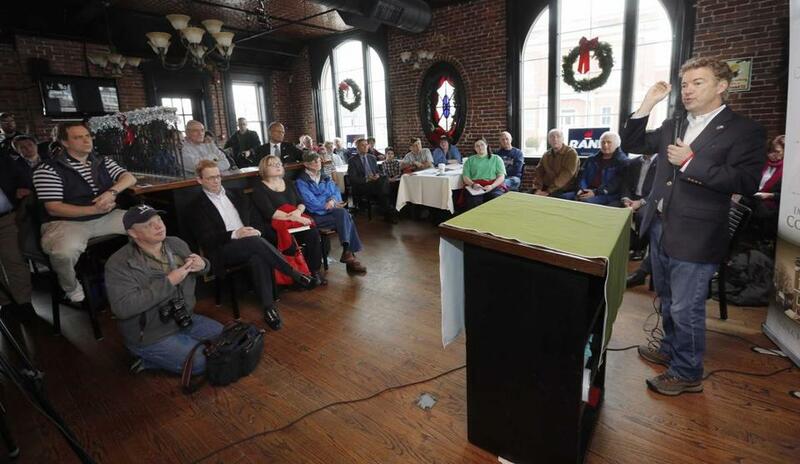 Rand Paul spoke in Derry, N.H., on Friday. CONCORD, N.H. – Kentucky Senator Rand Paul is confident he will be on the primetime Republican debate stage Tuesday, but if he falls short, he will make an announcement this week about what comes next. Later Saturday, Matt Chisholm, New Hampshire communications director for the Paul campaign, insisted his candidate was in the race to win. He said Paul’s quote referred to whether he would participate in a secondary debate on Tuesday if he didn’t qualify for the main-stage event. CNN, the host of Tuesday’s debate, is requiring candidates to have a national polling average of at least 3.5 percent or at least 4 percent in one of the early-voting states of New Hampshire or Iowa in order to participate in the main GOP debate. Those with weaker polling will be invited to participate in a separate debate earlier in the evening. According to RealClear Politics’ polling average, Paul is currently at 2.2 percent nationally, 2.7 percent in New Hampshire, and 4 percent in Iowa. With 14 major candidates remaining in the fight for the party’s nomination, Paul reiterated how crucial it is to be on the stage. New Hampshire state Senator Andy Sanborn, a Paul supporter, encouraged voters to pay more attention to issues than to polls. At the same campaign stop, speaking to a crowd of more than 50, Paul focused heavily on his proposals for strengthening gun rights and increasing national security. Renee Paradis, 54, of Laconia, said Paul is her top choice, but is worried about how his campaign is being run, citing an audio incident that started Saturday’s event. Saturday was Paul’s last scheduled New Hampshire trip of the year; he plans to return to the state in January. Clarification: This story and headline have been updated to reflect a clarification from the Paul campaign. Angelina Salcedo can be reached at angelinasalcedo7@gmail.com. Robert Way can be reached at therobway@gmail.com.